Bethesda opened up a mod world of endless creations after releasing its Skyrim Creation Kit earlier this week. 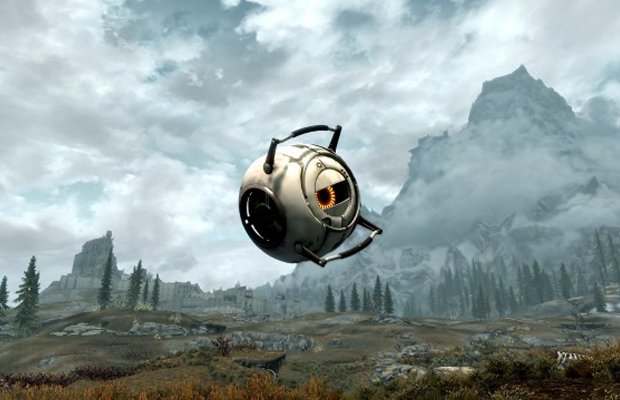 Valve took the new development kit for a ride and transported its beloved Space Core character from the Portal series into the medieval world of Skyrim. Robots and dragons—nice fit. The crossover mod allows you to pick up the core, launch, or kick it around like soccer ball, while it snaps a few smartass quips your way. One can only imagine some of the other crazy mods being created or surfacing the Net. Have Mario stomping out bandits or slay dragons with some heavy ammunition carried over from Modern Warfare 3. Maybe you’ll bring the Caped Crusader to face off against the Dragon Priest. Head over to the Steam Workshop and build your own fantasy crossover mod or entertain yourself by scrolling through the 500+ entries stored on the site. Watch the awesome mod in action below.